Handy make-up bag with sturdy zipper and zipper. This bag has no label and is therefore very suitable for customizing. Please note the make-up bags are sold per 5 pcs. So when you order '1', you get 5 bags. 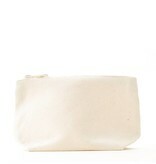 The bag is 18cm wide, 12cm high and the bottom is 7cm wide. The bag is made of heavy organic cotton canvas, the zipper by YKK (metal teeth and puller, fabric made of cotton). The bag can be washed at 30-40 degrees and will not shrink much. The bag is made in India and of course provided with the GOTS logo.